Born in the North of England, contemporary artist Elizabeth Orchard currently works between the UK and Florence, Italy. With a background in fashion and design, Elizabeth possesses an intuitive understanding of colour, texture and form. Her paintings evolve organically through a process of thoughtful experimentation. 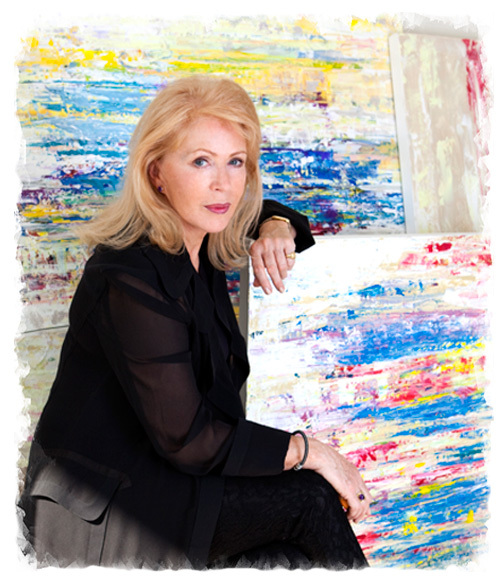 Working in acrylic and oil, she interweaves layers of pigment to produce deep, dynamic canvases that engage the imagination. Elizabeth is fascinated with the intersection of the individual and their material space. When creating commissioned works, she pays careful attention to the home of her client, to furnishings, finishes and textiles in particular. Elizabeth’s love for textiles is expressed in her hand-painted silk scarves, one-of-a-kind pieces suitable for the beach or the ballet. Elizabeth has established a broad client base and is now engaging the public through the exhibition of her work. Her first solo exhibition will be held at the Castello di Gabbiano and will run through the summer of 2018.